Nineteen years before Tim DeChristopher appeared at an oil-and-gas-lease auction and made bids on 22,000 acres of southern Utah land (and a very unlikely bid on the history of activism), three Utah activists stepped over a wire fence at Magna’s Hercules production site—now ATK—to protest the company’s part in creating components of Trident nuclear missiles. Those protesters used their willfully illegal act to put nuclear-weapons proliferation on trial in a West Valley courtroom in 1990. 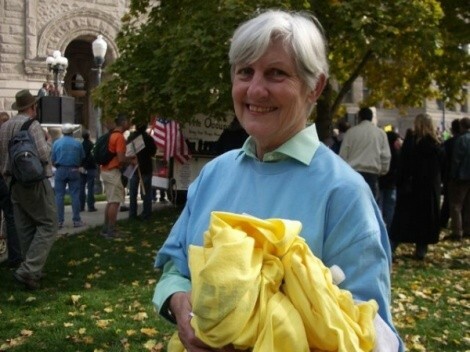 Today, two of the original “Trident Three,” anarchist and Quaker Diana Lee Hirschi, 68, and folk singer “Marvelous” Marvin Hamilton, 62, remain part of Salt Lake City’s gritty activist fabric (The whereabouts of the third member, Matthew Haun, remain unknown). In their eyes, some things change while others don’t, but the organized resistance that foster acts of protest like DeChristopher’s provide opportunities to raise awareness of issues affecting the world. In the ’80s and ’90s, that issue for members of the local peace movement was nuclear weapons proliferation. “We knew nuclear weapons were wrong, and we were willing to put our bodies on the line to stop [them] and take responsibility for the bomb in our backyard,” Hirschi says. On Oct. 20, 1989, the trio of activists trespassed in what could be considered the state’s most transparent act of criminal trespass. Following Gandhian principles of nonviolence, Hirschi, Hamilton and Matthew Haun had not only promoted their action to the media in advance but had also worked it out with Hercules company executives, who were on hand to offer the protesters coffee and donuts while they waited to be arrested. “He was very lucky that he managed to get support after the fact,” Hirschi says “He could have ended up hanging out to dry.” Hirschi’s group meticulously planned the protest in advance, so that each activist walking onto the missile-motor production plant was supported by an affinity group, with names like the Dirt People and the Strange Bedfellows, to help look after them while they faced court proceedings and possible jail time. “Our defense was completely the ‘necessity defense,’” says protester Hamilton, a former Vietnam rifleman, referring to the type of defense that argues that the defendant’s illegal action was necessary to prevent some greater harm. “We believed all along that if a group of sane people got experts to present this information to them, it would blow their minds,” Hamilton says. “We never disputed that we committed the crime.” With the judge allowing evidence against nuclear weapons in court, the jury acquitted them of all charges. “By silencing Tim, the government has made it clear that this case isn’t about justice, it’s about intimidation,” says Ashley Anderson, co-founder of the Peaceful Uprising organization. DeChristopher’s legal team has been denied the option to use the “necessity” defense and argue that his actions were a necessary defense against the hazards of global climate change. So, Anderson says, it will be up to the movement to educate the public that DeChristopher can be exonerated through jury nullification—whereby the jury rules contrary to the weight of evidence, in a de facto vote against the soundness of the law itself. “We want people to know that a jury has the right to judge the law and the facts,” Anderson says. “At the same time that I’m saying that you need organization and planning, I can turn around and say, “Let’s just walk straight into that hellfire,’” Hirschi says of times she and others would spontaneously cross onto weapons facilities. If the action motivates people, Hirschi says, it’s a success, no matter the consequences activists suffer. That’s an idea echoed by Anderson.